April 11, 2017—Salt Lake City—SwipeClock LLC today launched TimeWorksTouch, a new intelligent and interactive time clock to help companies better manage their workforces. Next-generation, cloud-based time clock technology and seamless integration with TimeWorksPlus, SwipeClock’s leading time and attendance solution, greatly improves timekeeping and payroll accuracy, lowers labor costs, and creates a better work environment for employees and company management. New capabilities include break tracking, schedule enforcement, buddy punching deterrents, overtime and Affordable Care Act (ACA) threshold alerts, and custom prompts to communicate with workers when they punch in and out. TimeWorksTouch is specifically designed to make timekeeping easy by meeting the needs of Payroll and HR Managers, Supervisors, and workers. TimeWorksTouch is an intelligent, interactive clock powered by TimeWorksPlus. Break and meal keys, schedule lockout, and early/late notifications are just some of the new features. Payroll and HR Managers—TimeWorksTouch has break and meal keys, schedule lock-out capabilities, clock prompts, and early/late notifications. These power capabilities give managers more control by accommodating customized pay rules, compliance requirements, and employee types, which greatly streamlines time, attendance, and payroll processes from start to finish. The new clock eliminates missed and unmatched punches and auto-syncs timekeeping and payroll systems to significantly reduce processing time and control costs. Supervisors—TimeWorksTouch delivers immediate insights and tools for absence and overtime management, leave planning, compliance, notifications, and time card approvals. These automated capabilities at the clock level significantly reduce the time supervisors spend gathering information, making decisions, and communicating with workers. They also improve communications between employees and management, creating a better work environment. Employees—TimeWorksTouch with PunchLogic provides simplified and accurate time punching, self-service approvals, and time card visibility. By making the time card process easier, interactive, and more informative, the new clock greatly reduces errors at the clock level, which then improves accuracy and reduces preparation time through the entire timekeeping and payroll process. Break Tracking—Dedicated break buttons for employees helps companies accurately track meals and breaks to ensure compliance with labor laws and regulations. Schedule Enforcement and Viewing—Integration with TimeWorksPlus enables the prevention of out-of-schedule punches. Employees are essentially “locked out” of punching in until the correct day and time of their shift. This greatly lowers overtime pay and unscheduled labor costs for companies. Employees can also view their schedules on the clock so they know when they are working. Biometric Reader—Positively identify fingerprints to prevent buddy punching, a practice that significantly adds to companies’ labor costs. In addition, supervisors can rapidly enroll employee fingerprints at the clock to save time for both managers and workers. 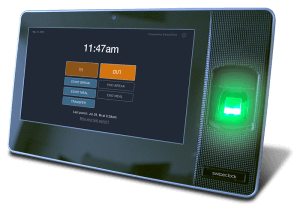 Interactive Prompts, Notifications, and Alerts—Create custom messages that display on the 7-inch color touch screen when workers clock in and out to enable two-way, convenient communication. This capability is ideal for using tips to improve clock usage, codes to streamline job costing, or providing responses to common employee questions. A separate button also enables workers to easily transfer to alternative jobs, projects, or departments. And employers can set alerts when hours are reached for overtime and ACA thresholds. State Awareness—Track the state of employees (clocked in or out, on break, using current job code, etc.) to eliminate missed punches and enable detailed timekeeping records. TimeWorksTouch includes many more features and benefits. Click here for a full list. TimeWorksPlus is the leading cloud-based time and attendance software that improves the efficiency of nearly one million employees every day. TimeWorksPlus simplifies time tracking so managers and supervisors can spend less time processing payroll. In addition, logging time on worker tablets, mobile phones, or computers—or with one of SwipeClock’s plug-and-play time clocks—eliminates messy time sheets by accurately transferring workforce data directly into payroll processing platforms. SwipeClock’s Workforce Management Suite includes TimeSimplicity for advanced scheduling, TimeWorksPlus for timekeeping and attendance, and intelligent web and mobile clocks for accurately controlling and capturing employee time. The suite of integrated solutions empowers companies with intelligent attendance management, enhanced leave management, and an employee self-service portal. These capabilities help ensure that business owners are in compliance with state and federal regulatory mandates, and enables SwipeClock’s partners to grow their own businesses by solving their clients’ most pressing labor challenges. TimeWorksTouch is now available. Contact SwipeClock or your SwipeClock authorized reseller. SwipeClock is a leading provider of cloud-based integrated workforce management solutions that include automated time and attendance, advanced scheduling, and leave management capabilities. The company’s products, including TimeWorksPlus, TimeSimplicity, and Workforce Management Clock enable employers to manage their most important and expensive asset—employees—by transforming labor from a cost of doing business to a competitive advantage. SwipeClock’s workforce management solutions are sold through over 850 partners that empower more than 26,000 businesses to lower labor costs, comply with regulatory mandates, and maximize their profits.